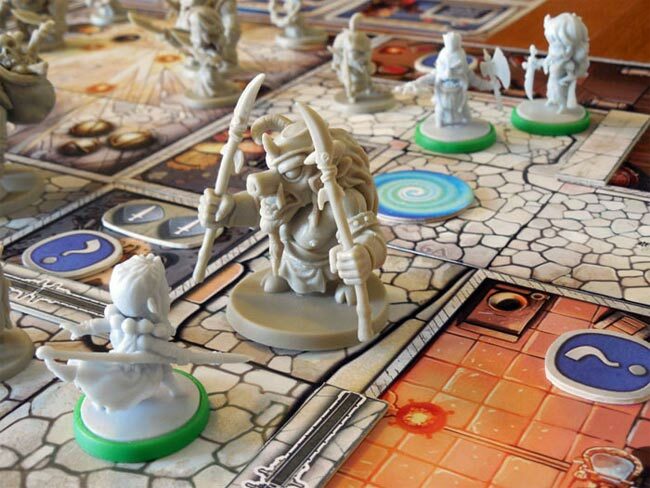 I had an opportunity to play the Arcadia Quest Board Game recently, and I really enjoyed it. I thought I would share some of my thoughts from play-testing this fun Dungeon Crawler. 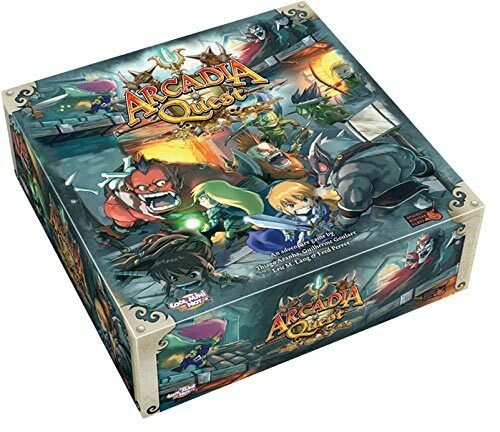 Arcadia Quest is made by CMON games, and designed by Eric Lang. Mr. Lang is the brainchild behind dozens of popular games including Blood Rage, Dice Masters, Star Wars TCG, The Godfather, and Warhammer. 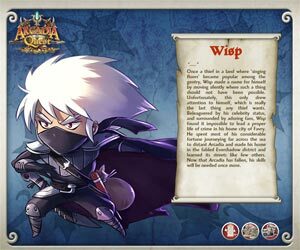 Arcadia Quest originally came out in 2014 and was funded by a Kickstarter campaign. The game is an adventure style board game that combines elements of PVE and PVP. PVP – Player vs. Player. You will directly attack your opponents. PVE – Player vs. Environment. You will also attack monsters that are on the board. The game has a Dungeons and Dragons (DnD) feel to it. But unlike DnD, no Dungeon Master is required. The Dungeon Master in DnD controls the environment and attacks with all the environmental monsters in play. 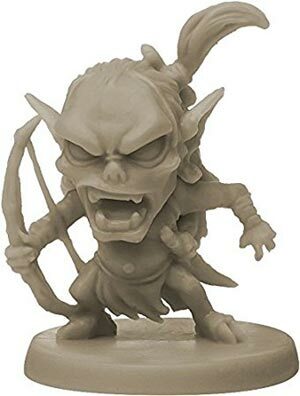 In Arcadia Quest, monsters automatically react to players dungeon movements and attacks, and no Dungeon Master is needed. All players get to actually play the game. Also in Dungeons and Dragons, players work together to achieve each scenario’s goals. 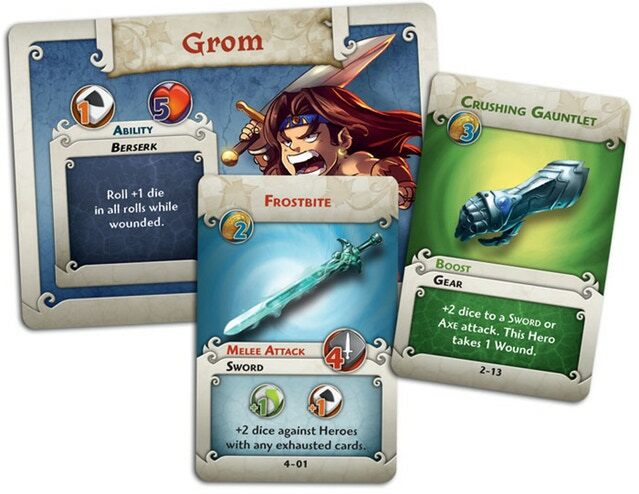 In Arcadia Quest, players are competing against each other to be the first to achieve each scenario’s goals. And players will attack each other with their swords, bows, wands and axes along the way. 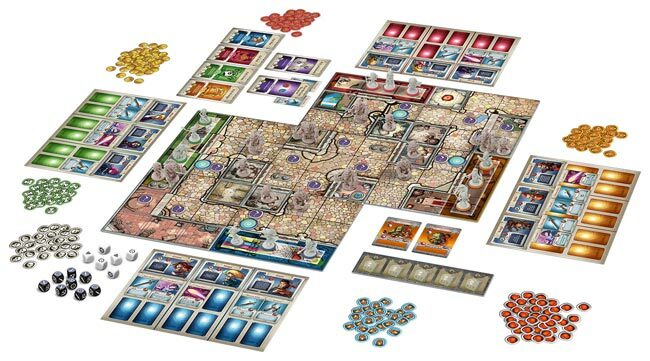 Aradia Quest is played on modular game board tiles that are assembled differently before each scenario. Miniature enemies are then placed on the board that each player has to contend with during the scenarios. Various treasures are also hidden on the board. Arcadia Quest is played with 2 to 4 players. 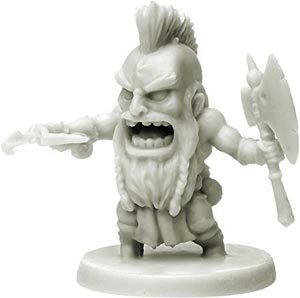 Each player will draft a Guild of 3 Heroes from the 12 different Hero Miniatures available and guide them through an Arcadia Quest campaign made up of multiple, different scenarios. Each Hero also has a unique Special Ability. Arcadia Quest is similar to a World of Warcraft dungeon raid, with Heroes working together as a team, except that you’re not the only Guild down in the dungeon. This is very basic overview on how a scenario in Arcadia Quest is played. As noted above, each player will draft 3 heroes to form their Guild. They will place their Heroes together in their starting area. Your Heroes will all start with some beginner weapons. Take 3 move actions and maybe attack. Or attack and then take 3 move actions. You can decide to attack another nearby player, a nearby monster, or try to move towards some loot in the dungeon. If one of your Heroes dies, he/she can be resurrected at any time by resting (skipping your turn). Gameplay is fairly simple. Players will roll dice and use their Heroes’ Special Abilities and weapons to determine damage during their turns. If you attack a PVE monster, the monster will also attack you back. If you walk past a monster, the monster will pull you into battle and attack you. Aradia Quest comes with a Campaign Book. There are 11 different Scenarios in the Campaign Book. Six scenarios played successively make a campaign. The scenarios range from Easy to Medium to Hard. After your first campaign you will have earned gold by killing monsters, killing other players’ Heroes, and by completing Scenario goals. At the end of the first Scenario, you will use the gold you have earned to purchase newer and stronger weapons. These stronger weapons will allow you take on the stronger monsters in the 2nd scenario. This process is rinsed and repeated until you have played through a campaign of 6 Scenarios. In the 6th Scenario, you will all face off against the evil Vampire Lord who’s controlling the lost city of Arcadia. This game is a lot of fun! I don’t miss the Dungeon Masters. There is not much downtime between turns because you are rooting for opponents to get beat up by during their turns. You will even roll the Attack and Defense dice of the monsters they are battling. Or you will be vigorously defending yourself while they are attacking you. Arcadia Quest is a pretty easy game to learn. The rulebook is over 30 pages long, but it is an easy read. And there are some great videos on YouTube so you can watch it played and learn that way. There’s a ton of stuff in the box. The box weighs over and 6 pounds and is crammed full of goodies. The box contains 37 miniatures! You also get double sided game board tiles, a rule book, a campaign book, coins, dice, tokens, cards, etc. The rule book is well written, explains the game well, and in full color. The campaign booklet is also well written. The scenarios and scenario setups are pretty easy to follow. The minis look great and have awesome detail. The figures have large heads kind of like “Chibis”. If you love painting minis, there are plenty of minis in this box to keep you busy. Lots of expansions and extra figures available. There are plenty of scenarios and heroes in this box, but you can easily add more heroes by purchasing them individually. The expansions also give your more campaigns to play through. Wisp? or Kakashi from Naruto? Fun references to Pop Culture’s existing heroes and villains. There are characters paying homage to Harry Potter, Lord of the Rings, Dragon Ball, Naruto, Labyrinth, Monty Python and other cool references. Game Play Time – 45 to 60 minutes. This is pretty good for a dungeon crawl. Learning games might take longer, but as everyone starts to understand the rules, the game play times come down. Campaigns! This was a change for me. Besides DnD, I haven’t played another game where you play a scenario, you level up your characters, and then you pick back up where you left off at another time for continuation. It’s fun to grow your characters over the campaign. Great Scoresheets! The game comes with nice Campaign Sheets and Inventory Sheets so you document how you finished each scenario. Then you can pick up right where you left off the next time you get together. There are even official PDF’s online to print more sheets as needed. Art Style – I like the bright, colorful and whimsical art on the cards. This game is not cheap. The Retail Price for Arcadia Quest is $99. That is quite a bit of $money$ for most people to dole out for a board game. There is a lot of stuff crammed inside the game box, so I’m sure this game is a very costly game to manufacture for CMON. If you keep your eye on Amazon.com you can sometimes find the game cheaper. Click here to check the current price on Amazon.com. The minis are not painted. I know … I also listed this as a Pro. But some people don’t like painting minis. And there are a lot of unpainted minis in here. The minis still have great detail, and painting them is totally optional. The game plays the same whether you paint the figures or not. Too many Kickstarter Exclusives? This game arose from a Kickstarter Campaign. So in order to generate a lot of income, CMON offered a lot of Exclusive Heroes, Villains and Dragons. There are over 100 Heroes you can use, and it seems about 50% of them were exclusives to Kickstarters. If you are late to the game, and also a completionist, it will be difficult to track down all the Arcadia Quest exclusives. Please Note: None of those exclusives are really needed to play or enjoy the game. PVP. Some folks don’t like games where you directly attack other players. This definitely is not a co-op game. The box storage design is not great. It takes some finagling to get all your stuff back in the original box. I think a lot of people start keeping their minis in a separate box. Set up Time. Each scenario takes about 10 minutes to set-up. Some folks might enjoy this, while others might find it tedious. I like that there are additional Heroes you can add to the game to spice things up. Sprinkling in a few more heroes to the initial draft gives everyone more choices so they can build a team they really want to play with. I think the game plays best at 4 players, but still plays well with 2-3. And if you ever get bored of the 11 Scenarios included with this game, you can always go out and grab another expansion. There are plenty of other expansions to add to your Collection: Arcadia Quest: Pets; Arcadia Quest Beyond The Grave Campaign Game; Arcadia Quest Inferno; Masmorra Dungeons of Arcadia Board Game; Arcadia Quest Frost Dragon Board Game; etc. Click here to read some of our other Board Game reviews.